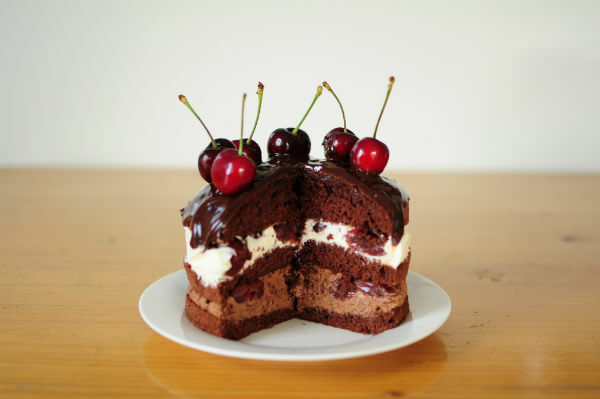 Black forest cake. When this particular cake is mentioned, most people tend to think of the chocolate cake with cherries decorated with cream rosettes, maraschino cherries, chocolate flakes and sprinkles. You might think it's a little bit retro, but it holds a special place in my heart. My first few attempts were even decorated somewhat based on the original design. You see, when I was a kid, my cousins and I would mostly get one of those birthday cakes ordered from a Chinese cake shop with a Teletubby, Sailor Moon or Pokemon character on top. Written across the cake in chocolate would read 'Happy __th Birthday [insert name here]!'. Just like blowing out the candles, this was everyone's favourite part and all the kids would fight over who gets more. Candles even had to be relighted just so everyone else could blow out the candles (haha). But the birthday kid always got the first slice with the most chocolate bits. One birthday, I didn't get one of those cakes. Instead, I received a black forest cake from The Cheesecake Shop. It was just so different compared to the other cakes that it left a pretty big impression. Not to mention it was pretty tasty too. I make this cake from time to time, without a proper recipe, but this time I measured out the ingredients and changed the standard whipped cream filling to a chocolate mousse and coconut whipped cream layer instead. The coconut whipped cream was actually inspired by Cadbury's cherry ripe, my favourite last minute check out counter impulse purchase. If chocolate, coconut and cherries taste good in a bar, it'll surely taste good in a cake, right? Right?! My dad and I liked the addition of the coconut, but my mum thinks it overpowers the cherries. Grease and line a 15cm round baking tin with baking paper. Preheat oven to 200C. Sift flour, cocoa powder and cornflour together four times and set aside. Separate all the eggs. Add a pinch of sea salt into the egg whites and whisk eggs until they reach soft peaks. Sift in the cream of tartar and whisk egg whites, gradually adding 15g of caster sugar until mixture becomes glossy and reaches stiff peak stage. When bowl is turned upside down, the egg whites should not slide and fall out. In a separate bowl, whisk the egg yolks with 50g caster sugar and vanilla bean paste until mixture is thick and fluffy. Mixture should be pale yellow, thickened and reached ‘ribbon stage’ – when the whisk / beater is lifted and moved, the mixture should be able to form a ‘ribbon’ that will stay on the surface for a few seconds. Fold one-third of the egg whites into the yolk mixture to lighten. Sift the flour, cocoa powder and cornflour over the top and spread the remaining egg whites on top. Fold gently to combine. Transfer mixture into the baking tin and smooth the top with the back of a spoon. Place the tin into the oven and reduce temperature to 170C. Bake for approximately 20 – 25 minutes or until skewer comes out clean when inserted in the center. Allow sponge to cool in the tin for 5 minutes before transferring to a wire rack to cool. Melt dark chocolate and 50ml thickened cream in a double boiler / microwave and mix to combine. Allow to cool and whisk with an electric beater until fluffy. Gently fold into the whipped cream and refrigerate until required. Toast shredded coconut at 150 degrees for 5 - 10 minutes or until golden brown. Transfer to a saucepan and pour in the thickened cream. Mix and bring to a simmer. Remove from heat and allow to cool completely. Strain cream as much as possible and top up with extra cream to make up 150ml. Refrigerate and when completely cool, whip with caster sugar until it is firm. Refrigerate until required. *If you don't want coconut flavoured cream, simply whip cream with a dash of vanilla essence or 1/4 tsp vanilla bean paste. **You will get around 70 - 80ml cream after the straining. Make sure to press the coconut against the strainer repeatedly with a back of the spoon to extract as much cream as possible. Drain the jar of cherries. Reduce the syrup in a saucepan by half and set aside to cool. Cut the sponge into 3 equal slices. Place the bottom slice onto a cake board / plate and brush the top with the reduced cherry syrup. Pipe or spread the chocolate mousse on top, leaving a 0.5 – 1 cm border around the edges. Top with a layer of drained jarred cherries. Place the middle slice of the sponge on top and repeat the above step once, replacing the chocolate mousse with the coconut whipped cream. Top with the remaining cake slice. Melt dark chocolate and thickened cream in a double boiler / microwave and mix to combine. Pour onto the top cake slice and use the back of the spoon to smooth. Top with fresh cherries. Place into a suitable container and chill before serving. (C) Grub 2009 - 2014. Simple theme. Powered by Blogger.